This ekphrastic poem makes reference to some of Goya's works. Follow the links for more information about each. "The Four Doctors of the Church" refers to a series of paintings of saints, only three of which are extant: St. Gregory, St. Augustine, and St. Ambrose. "Paper Swallow" refers to the poem itself. "My praying hands are fish fins" may refer to the Jewish practice of using the hands to determine if a fish has both fins and scales, and if it would, therefore, be considered to be kosher. "Time, the invisible snake" may refer to the ancient conception of Time as a snake eating its own tail. "Coño" means "cone" in Spanish. This may refer to the cones of the retina which are responsible for color vision. The Ebro is a major river on the Iberian peninsula. "Marrano" means "pig" in Spanish. The term also refers to Spanish Jews who "converted" to Catholicism during the Inquisition. This reference compliments the "fish fin" reference (see above). Blindness and eye references occur throughout the poem. 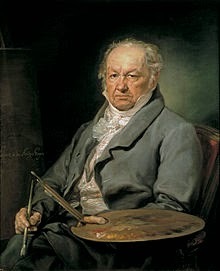 Perhaps the poet is saying that Goya has helped him to see the world in a new but disturbing way. The poem must force his eyes to see the truth as Goya depicted it.